It’s easy to downplay or even dismiss the threat by Iranian warships said to be on their way to sail close to U.S. maritime borders if one merely looks at this move as taking place in a geopolitical vacuum. The problem is that we are not residing in such a vacuum, and the majority of Americans are not understanding the significance of events that have been taking place since the planning phases of the “Arab Spring.” The American public is not getting the truth from the White House or the Western media that appears to be covering for, if not facilitating the Obama agenda. How is this relevant to Iranian warships reportedly planning to prod the U.S. maritime borders? To understand why this is happening, we’ve got to understand the bigger picture. The Obama agenda, as it is for now and as it has been since day one, is the Saudi agenda. That agenda calls for the toppling of various governments and the installation of an Islamic Caliphate under the control of the Muslim Brotherhood. As an aside, I might ask whether the selection of Barack Hussein Obama is starting to make more sense now, and whether the mystery funding by foreign (Saudi) interests to his campaign also is beginning to make sense. Might this not place the Muslim Brotherhood infiltration of the U.S. government into appropriate context as well? But I digress. To understand why Iran seems to be suddenly stirring things up, you’ve got to understand the “back-story.” Not the fairy tales manufactured by the Obama regime or it’s media sycophants, but the real, difficult to accept accounting of our involvement in the Middle East. If you’ve read my numerous reports about Benghazi, you’ll already understand that our continued push to rid Syria of Assad would be answered through asymmetrical means. Through this movement of Iranian war ships, we are witnessing the movement of chess pieces in this game of global, 3-D chess. We must keep in mind that this game has different boards, layers and pieces. 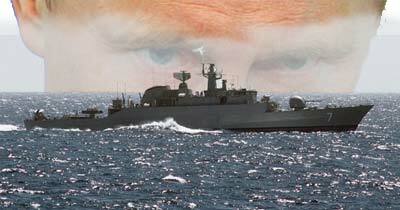 The Iranian ships are but one piece on one board. There are many others, each inter-related. Simply put, Iran is a proxy nation of Russia, much like North Korea is a proxy nation of China. Both Russia and China have military and economic interests in Syria, which is the back door to Iran. Under Obama, the puppet attached to Saudi strings, played a central role in unceremoniously dispatching Gaddafi to his final reward under the pretext of freeing an oppressed Libyan people. You might recall the glee expressed by former Secretary of State Hillary Rodham Clinton when given the news that Gaddafi was finally out of the way.